Finally got some serious cleaning around the house, got some things reorganized. Isn't my counter pretty? 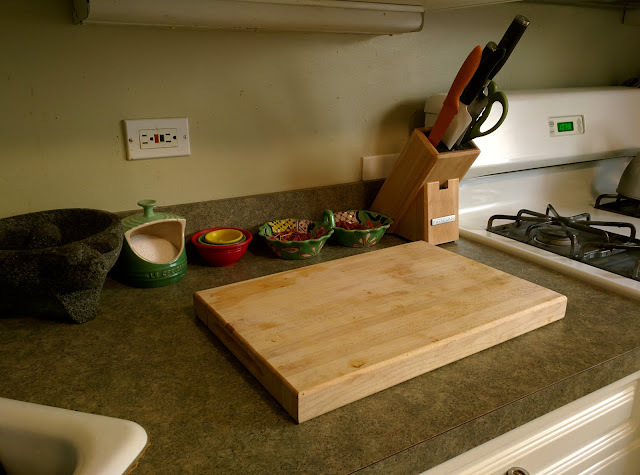 I was excited to get my cutting board area set up how I like :). Drew came home from a trip yesterday so I wanted something comforting, something with flavors he is used to me using. 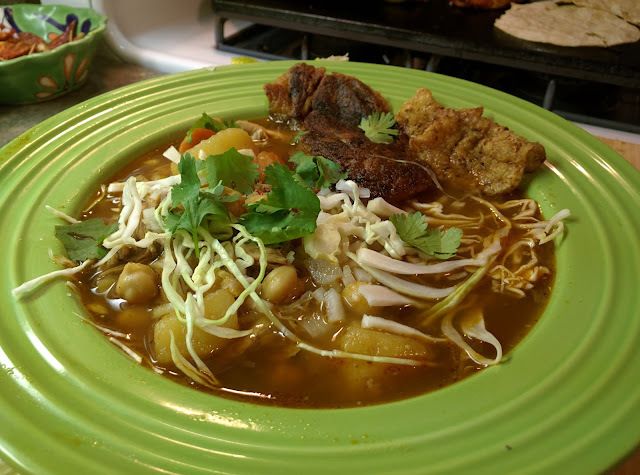 He loves soup so I went with caldo tlalpeño, something I have gone to in the past, I really enjoy making it, and eating it! 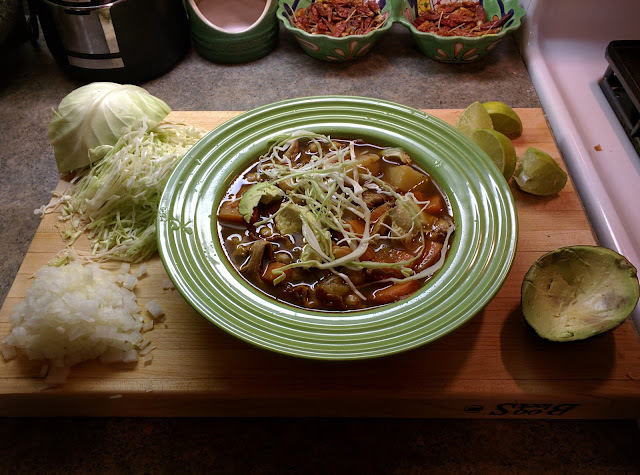 Caldo tlalpeño reminds me very much of something like pozole or menudo: a broth with a puree of chiles and spices stirred in for flavor and heat. 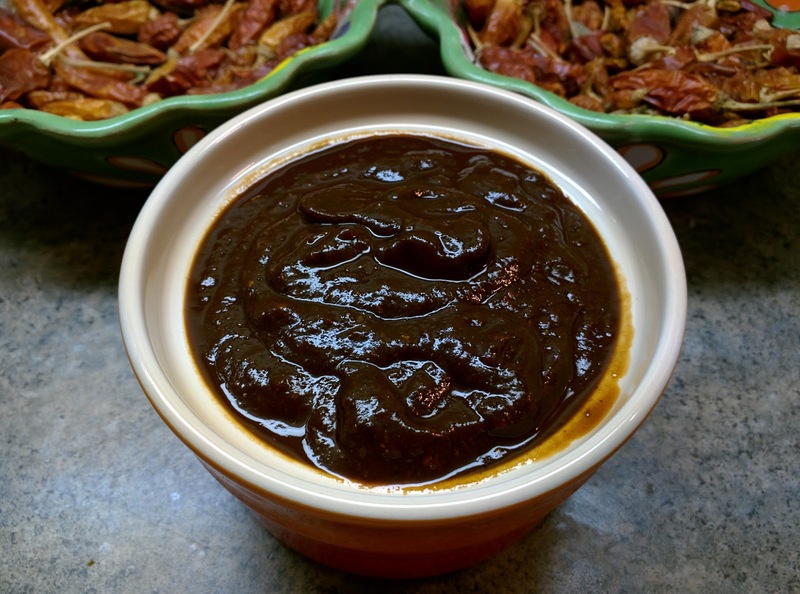 Typically it is done with chipotles and can be put together very easily with canned chipotles in adobo. I had roasted guajillo, ancho, chipotles, and garlic on the comal earlier in the week for something else, so I decided to use this mixture. I added the chiles to a blender jar and topped with boiling water. I let this sit for about 20 minutes, then added cumin seeds, bay leaves, and Mexican oregano which I also toasted on the comal. The result was a deep dark red puree. 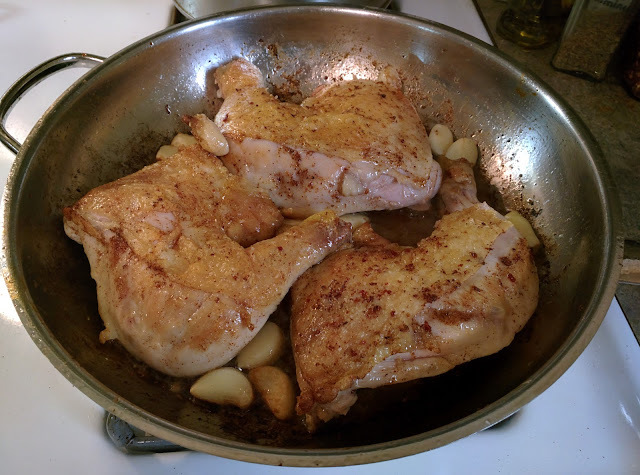 I seared chicken legs in a skillet, I wanted to get the cooking process started on these and got some additional flavor by cooking in a little bit of bacon fat. I added garlic towards the flavor to give it more of a garlic flavor. I removed the skin from the legs and let them continue to render out. After that the legs went for a swim in chicken broth with my paste mixed in. I let this simmer on low for about 40 minutes until the meat was falling off the bone. 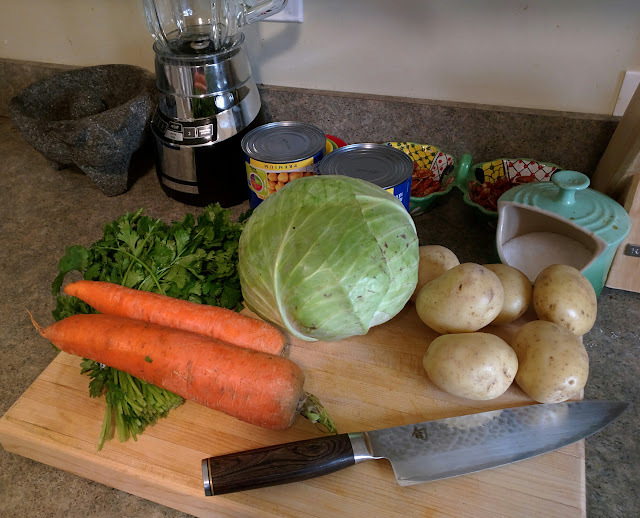 While the chicken was cooking, I prepared my vegetables that would go into the soup. Carrots, potatoes, garbanzo beans will go right into the cooking soup. Cabbage and cilantro will go on top when it is all done. I cubed 1 carrot and 3 potatoes and added to the cooking soup during the last 15 minutes. I also drained one large cans of garbanzos and tossed it in while it finished simmering. To finish, I served in bowls and topped with diced onion, shredded cabbage, chunks of avocado, and lime juice. I added cilantro and tortilla chips broken up into the soup as well. For the second helping, I added the crispy chicken skin that I left in the skillet as well as a chile pasado relleno. A relative just came back and brought back chile pasado which is a roasted then dried poblano, typical of where my family is from. My mom surprised me with rellenos made from these and thought it would be perfect with the soup. - Toast chiles, garlic, cumin, oregano, bay leaves on a comal. Do herbs and spices last as they toast the fastest. For ancho you want a tobacco brown color to develop. 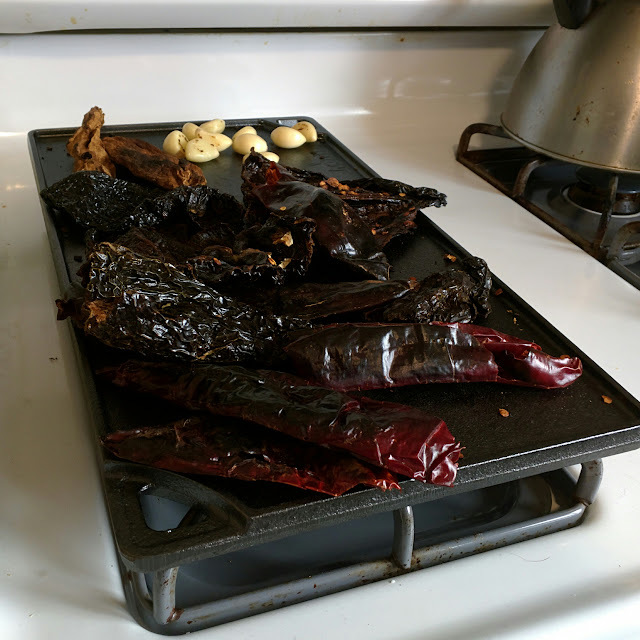 The guajillo will start to get a deeper red hue, chipotles will get more brown as they toast. - Sear chicken legs in a skillet , until browned. I removed the skin to crisp up but it can also stay. Deglaze pan with some chicken broth. 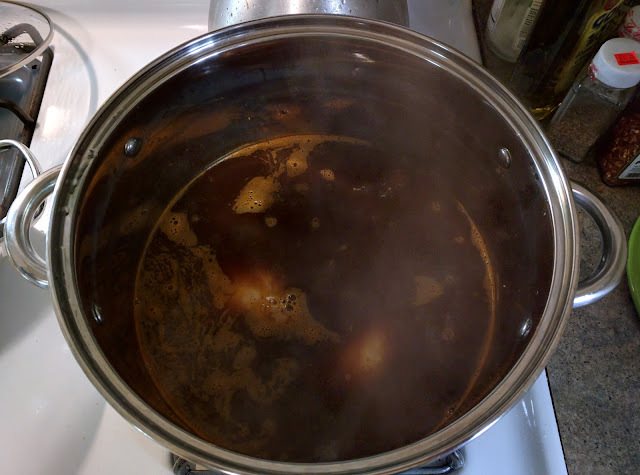 Move chicken thighs and rest of chicken broth to a large pot and simmer for 45 minutes. 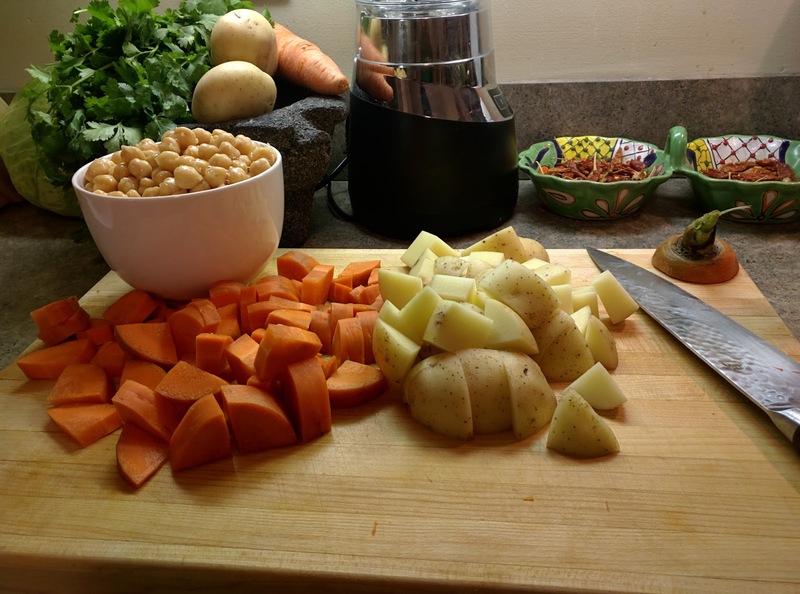 - after 30 minutes add carrot, potato, and garbanzo beans to the pot. - Serve in bowls and top with as much cabbage, cilantro, avocado, tostadas and lime juice as you like!